Solid state power devices complement the rapid switching required by PID temperature controllers and help deliver optimum system performance and service life. The EZ-ZONE® ST integrated solid state controller from Watlow® offers a complete thermal system control solution in a single package. 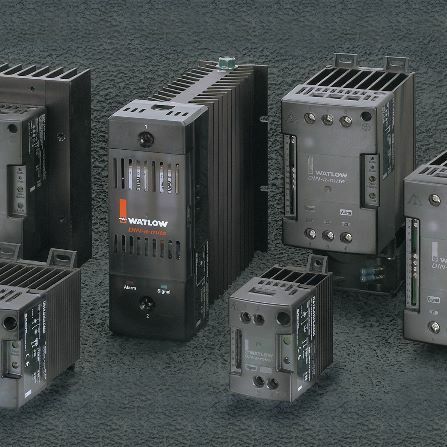 POWER SERIES solid state controllers include single- and three-phase models from 65 to 250 amperes. Field configurable phase-angle or zero-cross firing improves application flexibility on-site where needed. The QPAC modular controller from Watlow is a modular silicon controlled recti?er (SCR) power controller with plug-in features for ?exibility. Bases are rated from 150 to 1000 amperes in one-phase, three-phase, two leg and three-phase, three leg configurations.